Mayor David Kogon echoed her comments. “It is volunteers like all of you here tonight that bring a richness to our lives that would not be here without your efforts,’ he told the more than two dozen volunteers who were presented with certificates during the event. 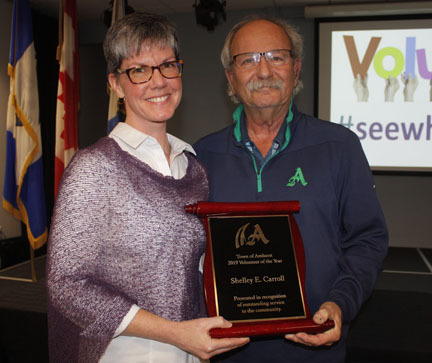 Shelley E. Carroll, Amherst’s Adult Volunteer of the Year, for her volunteer efforts with several organizations including the Amherst Valentines Run, Amherst Minor Hockey, Cumberland Minor Hockey, Amherst Striders, ARHS Basketball, 100 Women of Cumberland County, Cumberland Health Authority and the Community Christmas Dinner as well as volunteering in school band and athletic programs. Aaron Froese, Amherst’s Youth Volunteer of the Year, for his volunteer efforts coaching athletes in multiple programs with Fundy Youth Soccer, Amherst Wesleyan Church, Springhill Baptist Church and Cumberland Sporting Club.